In June, the gallery is proud to present six geographically diverse and provocative solo shows ranging from Kenneth Hoffman’s images of Vietnam taken while he was an Army Lieutenant during the war to Robert Kalman’s images of the elders of Larreynaga, Nicagara to Neil O. Lawner’s amusing look at New York City’s holiday windows. Irene Imfeld’s Vacant Nests, the third and final portfolio selected from our annual International Portfolio Competition rounds out the exhibition. OPENING RECEPTION: Tuesday, June 7, 2016, from 6pm to 8pm. Everyone welcome. I was an Army Lieutenant working for the Department of Defense as a photographer-film director in Vietnam from June 1969 to June 1970. This period was marked by some of the war’s most challenging times including the US Cambodian incursion which I covered. While the war itself was the most photographed war in history and has even been called “The living room war,” the culture of Vietnam and the lives of its people during this time was not recorded to the same extent. These photos take the point of view of the photographer as observer discovering the people of Vietnam in the midst of their war-torn country. From the Montagnard tribesman in Pleiku to the street children of Saigon, I sought whenever possible to look beyond the war itself—to record the people whose inner dignity showed through the circumstances into which they were forced. 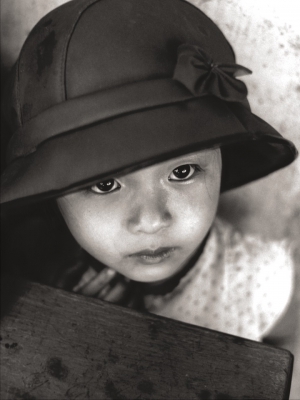 Among my most haunting recollections are the faces of the street children (Bui Doi or “Dust of Life”) and their soulful stares. I have attempted to preserve this aspect of the war lest it might be forgotten—to all our losses. Walking home in 2015, I stopped to pick up an Autumn leaf. In July. The leaf was brittle and brown along its top third, while the lush green living part seemed to be engaged in a fighting retreat toward the stem. There was no question about the ultimate outcome. This project is not about vibrant fall foliage. I want to focus in on the reluctant and beautiful bleeding out of life toward the cold sleep of December and how in response we turn nature or any found object into art. Around this time, I came across a web post showing how a photog attached a flatbed scanner to his 8x10 view camera. While this was too much work for me, I thought I could use a flatbed scanner as a camera by placing objects on the glass. Needless to say, I promptly discovered that I was not the first to have this idea. But there it is. Larreynaga is a small Nicaraguan farming community located 26 miles east of the city of León. It is a harsh, arid region that’s sparsely populated because it borders on being inhospitable. The median age in this, the second poorest country in the western hemisphere, is twenty-four. 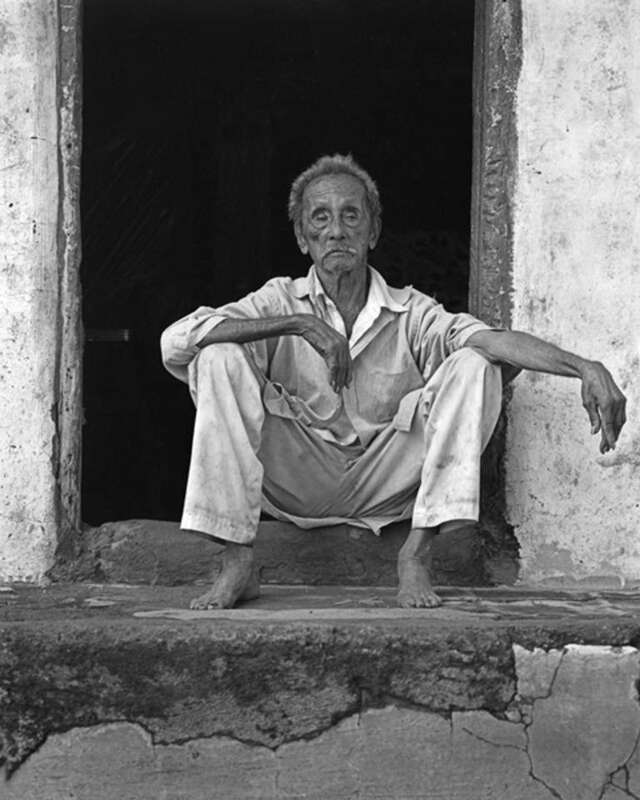 Nevertheless, in this out of the way impoverished village with limited access to health resources, there are a considerable number of elders, people ranging in age from 70 to 105. God's opportunity, as it were, seems to have been the bestowal of a considerable length of life, and of robust good health, on these remarkable people. 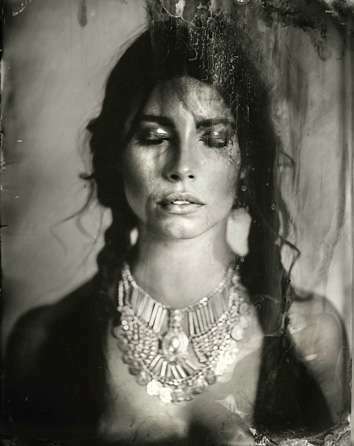 My wet plate portraits are riddled with perfect imperfections that enhance their distinctive and beautiful aesthetic. 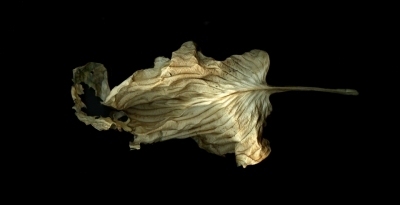 The unique, organic process behind the creation of each photograph transcends the images perceived flaws to give life to a dark and romantic beauty. I choose this alternative photographic process as a way to express my artistic expression, explore my inner feelings and connect with my subject. New York City offers so much to arouse the senses. Often we may find ourselves immersed in a dynamic visual cacophony of people, colors and shapes. 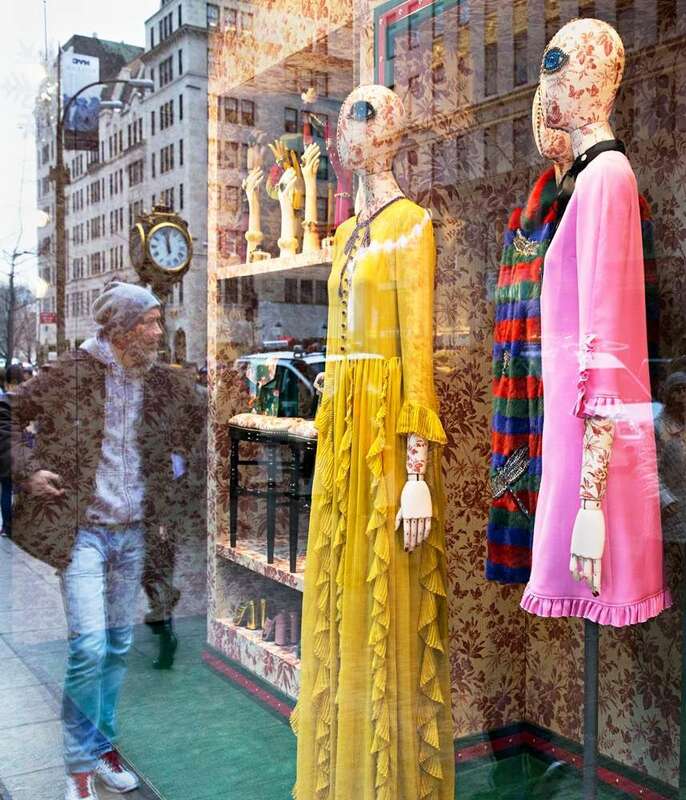 On Fifth Avenue, the transformation of the storefront display windows in preparation for the holiday shopping season is a prime example of that visual cacophony. 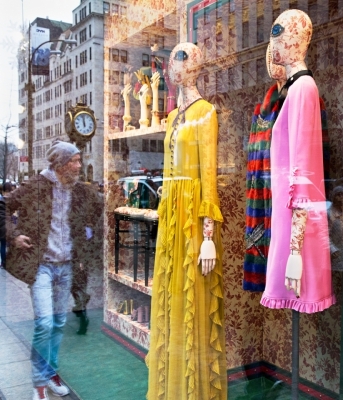 In making these photographs, I pointed my camera at the seasonal window displays with the intention of documenting the interesting juxtaposition of energetic people and window mannequins in the annual shopping ritual. In doing so, I found not only what I sought, but also an added bonus for me.... a bit of humor. Vigário Geral, Brazil is located in the Northern part of Rio de Janeiro. It is a favela, most famous for the Vigário Geral Massacre in 1993. There are roughly 900 favelas in Rio. 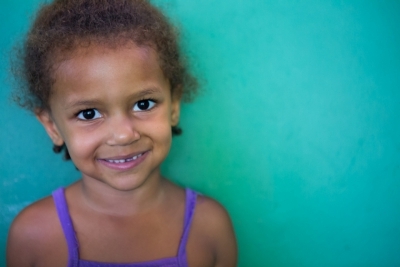 The life choices for young children of the favelas are often limited to drug trafficking, domestic help or manual labor. This is slowly changing as children engage through organizations like AfroReggae, an NGO promoting social change through culture and arts in concert with the strong sense of family and community that already exist. Expanding upon my study of natural form through landscape, I wanted to share a close look at the natural form of the beautiful birds I knew. Audubon acted from a similar impulse when drawing his largest images —making the detail visible to his audience. Another master of detail, Durer, made a wonderfully delicate drawing of a blue wing in all its elegance and intricacy. The form and fine detail take on an abstract quality when viewed up close. I have emphasized the abstract qualities by positioning the subjects in a variety of orientations, cropping for composition, and providing an empty background. For many years I kept a variety of caged birds at my workplace for companionship. After several changes of circumstance, a family of zebra finches were settled at my home. The finches were always prolific but eventually we became concerned that the flock was becoming inbred. Facing the choice of introducing new birds or letting the population naturally decline, we began removing eggs. We accumulated lots of eggs and, over time, the remains of our last birds. 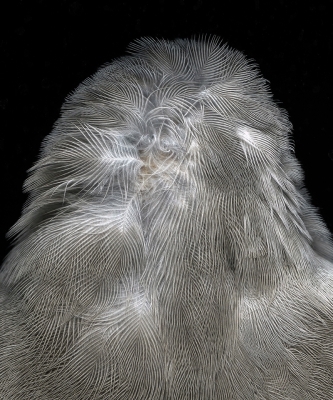 I’ve chosen to remember them and reveal their exquisite form through these photographs. Examining each unique little being makes me think about the value of any individual—and even of life itself.